The multithread is the concurrent and asynchronous programming facility on the Solaris operating system. Asynchronous programming is required for programs to respond to external events via multiple sensors occurring independently of the program's state. Parallel programming is effective to improve performance of computation bound processing such as image processing and interference checking in path planning. Multithread EusLisp (MT-Eus) runs on the Solaris 2 operating system with one or more processors. Solaris's threads are units for allocating CPU in a traditional UNIX process, having shared memory and different contexts. The thread library provided by the Solaris OS allocates each thread to a single LWP (light weight process), which is a kernel resource. The Unix kernel schedules the allocation of LWPs to one or more physical CPUs based on thread priorities assigned to each thread. Fig.5 depicts the relations between threads, LWPs, and CPUs. Two major changes in the design of the contexts and the memory management of EusLisp have been made to upgrade it to multithread capabilities. MT-Eus allocates private stacks and contexts to each threads so that they can run independently of each other. Objects such as symbols and conses are allocated in the shared heap memory as in sequential EusLisp. Therefore, thread-private data such as block labels, catch tags, and local variables are protected from other threads, whereas values (objects) pointed by global variables are visible to all threads allowing information exchange among threads. A context consists of a C-stack, a binding-stack and frame pointers that chain lexical blocks such as lambda, block, catch, let, flet, and so on, and is established when a new thread is created. Since more than one context can be active at the same time on a real multi-processor machine, we cannot hold a single pointer to the current context in a global variable. Rather we have to add one more argument to every internal function to transfer the context pointer from the topmost eval to the memory manager at the bottom. EusLisp adopts a Fibonacci buddy memory management scheme in a single heap for every type of object. After running programs having different memory request characteristics, we have been convinced that Fibonacci buddy can allocate objects of various sizes equally fast, garbage-collects quickly without copying , and exhibits high memory utilization (the internal loss is 10 to 15% and the external loss is negligible). For multithreading, the second point, i.e., non-copying GC, is very important. If addresses of objects were changed by copying-GC, pointers in the stack and CPU registers of all thread contexts would have to be redirected to new locations, which is impossible or very difficult. All memory allocation requests are handled by the alloc function at the lowest level. 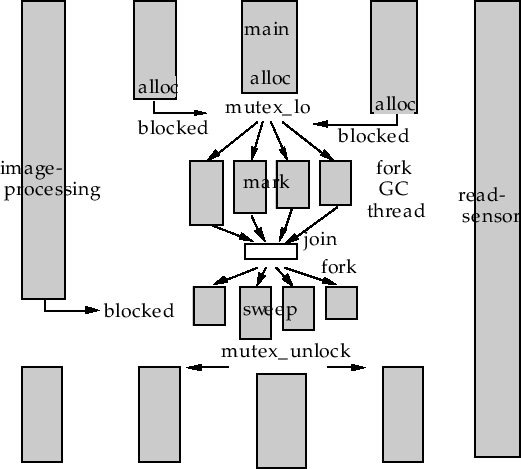 Alloc does mutex-locking because it manipulates the global database of free lists. Since we cannot predict when a garbage collection begins and which thread causes it, every thread must prepare for sporadic GCs. All pointers to living objects have to be arranged to be accessible by the GC anytime to prevent them from being reclaimed as garbage. This is done by storing the pointers to the most recently allocated objects in fixed slots of each context, instead of trusting they are maintained on the stacks. Fig. 6 illustrates flow of threads requesting memory and forked inside GC to process marking and sweeping in parallel. Note that threads that do not request memory or manipulate pointers can run in parallel with the GC, improving real-time response of the low-level tasks such as signal processing and image acquisition. In order for Solaris to execute a program in parallel on many processors, the program needs to be written as a collection of functions, each of which is executed by a thread dynamically created in a process. Although the time required for thread creation is faster than process creation, it takes a few mili-seconds for EusLisp to start off a thread after allocating stacks and setting a page attribute for detecting stack-overflow. Since this delay, which should be compared to a function invocation, is intolerable, sufficient number of threads are created by the make-thread function beforehand and put in the system's thread pool, eliminating the need for system calls at evaluation time. Each thread in the thread pool is represented by a thread object, as depicted in Fig.7, consisted of thread-id, several semaphores for synchronization, and slots for argument and evaluation result transfer. Figure 7: Thread-object for transferring control and data between threads (left) and the collection of threads put in the thread-pool. For the allocation of parallel computation to threads, the thread function is used. Thread takes one free thread out of the thread pool, transfers arguments via shared memory, wakes up the thread by signaling the semaphore as indicated in fig. 7, and returns a thread object to the caller without blocking. The woken-up thread begins evaluation of the argument running in parallel to the calling thread. The caller uses wait-thread to receive the evaluation result from the forked thread. The plist macro is a more convenient form to describe parallel evaluation of arguments. Plist attaches threads to evaluate each argument and lists up results after waiting for all threads to finish evaluation. MT-Eus has three kinds of synchronization primitives, namely mutex locks, condition variables, and semaphores. Mutex locks are used to serialize accesses to shared variables between threads. Condition variables allow a thread to wait for a condition to become true in a mutex-locked section by temporarily releasing and re-acquiring the lock. Semaphores are used to inform occurrences of events, or to control sharing of finite resources. These synchronization primitives cause voluntary context switching, while the Solaris kernel generates involuntary task switching on a time-sliced scheduling basis. Barrier-synch is a mechanism for more than two threads to synchronize at the same time (Fig. 8). For this purpose, an instance of the barrier class is created and threads that participate in the synchronization register themselves in the object. Then, each thread sends the :wait message to the barrier object, and the thread is blocked. When the last thread registered in the object sends its :wait message, the waits are released and all waiting threads get a return value of T. Barrier-sync plays an important role of global clocking in a multi-robot simulation. Synchronized memory port is a kind of stream to exchange data between threads (Fig. 8). Since all threads in a process share the heap memory, if one thread binds an object to a global variable, it instantly becomes visible to other threads. However, shared memory lacks capability to send events that the global data is updated. Synchronized memory port ensures this synchronization for accessing a shared object. A synchronized memory port object consists of one buffer slot and two semaphores used for synchronizing read and write. Real-time programs often require functions to execute at predetermined timing or to repeat in particular intervals. Sequential EusLisp could run user' functions triggered by signals generated periodically by Unix's interval timers. This preemption can cause deadlock in MT-Eus, because interruption may occur within a mutex-ed block. Therefore, control must be transferred at secured points such as at the beginning of eval. To avoid delays caused by the above synchronization, MT-Eus also provides signal-notification via semaphores. In other words, the signal function takes either a function or a semaphore that is called or posted upon the signal arrival. Since the semaphore is posted at the lowest level, latency for synchronization is minimal. The following a example image processing program coded by using the multithread facilities. Image input thread and filtering threads are created. samp-image takes image data periodically by waiting for samp-sem to be posted every 33msec. Two threads synchronize via read-and-write of a thread-port. Filter-image employs two more threads for parallel computation of filtering. Table. 3 shows the parallel execution performance measured on a Cray Supserserver configured with 32 CPUs. Linear parallel gain was obtained for the compiled Fibonacci function, because there is no shared memory access and the program code is small enough to be fully loaded onto the cache memory of each processor. Contrally, when the same program was interpreted, linearly high performance could not be attained, since memory access scatters. Further, some programs that frequently refer to shared memory and request memory allocation cannot exhibit better performance than a single processor execution. This can be understood as the result of frequent cache memory purging. A thread is a unit for assigning computation, usually evaluation of a lisp form. Threads in EusLisp are represented by instances of the thread class. This object is actually a control port of a thread to pass arguments and result, and let it start evaluation, rather than the thread's entity representing the context. creates num threads with lsize words of Lisp stack and csize words of C stack, and put them in the system's thread pool. 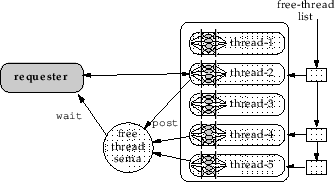 All the threads in the thread pool is bound to sys:*threads*, which is extended each time make-thread is called. 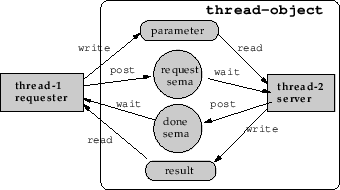 By the thread function, a computation is assigned to one of free threads in the thread pool. Therefore it is not a good idea to change stack sizes from thread to thread, since you cannot control which thread is assigned to a specific computation. returns the list of all the threads created by make-threads. returns the list of threads in the free thread pool. If the result is NIL, new commitment of a task to a thread is blocked until any currently running threads finish evaluation or new threads are created by make-thread in the free thread pool. picks up one free thread from the thread pool, and assigns it for evaluation of (func . args). Sys:thread can be regarded as asynchronous funcall, since sys:thread applies func to the spread list of args but it does not accept the result of the function application. Rather, sys:thread returns the thread object assigned to the funcall, so that the real result can be obtained later by sys:wait-thread. assigns computation to one of free threads. The thread is reclaimed in the free thread pool when it finishes evaluation without being wait-thread'ed. waits for thread to finish evaluation of funcall given by the sys:thread function, and retrieves the result and returns it. Sys:wait-thread is mandatory if the thread is assigned evaluation by sys:thread because the thread is not returned to the free thread pool until it finishes transferring the result. evaluates forms by different threads in parallel and waits for the completion of all evaluation, and the list of results is returned. Sys:plist may be regarded as parallel-list except that each form listed must be a function call. Among Solaris operating systems four synchronization primitives for multithread programs, EusLisp provides mutex locks, conditional variables, and semaphores. Reader-writer lock is not available now. Based on these primitives, higher level synchronization mechanisms, such as synchronized memory port and barrier synchronization, are realized. makes a mutex-lock and returns it. A mutex-lock is represented by an integer-vector of six elements. locks the mutex lock mlock. If the mlock is already locked by another thread, mutex-lock waits for the lock to be released. releases mlock and let one of other threads waiting for this lock resume running. Mutex-lock and mutex-unlock have to be used as a pair. Mutex is a macro that brackets a critical section. Mlock is locked before evaluating forms are evaluated, and the lock is released when the evaluation finishes. This macro expands to the following progn form. Note that unwind-protect is used to ensure unlocking even an error occurs during the evaluation of forms. makes a condition variable object which is an integer vector of four elements. The returned condition variable is in unlocked state. waits for condvar to be signaled. If condvar has already been acquired by another thread, it releases mlock and waits for condvar to be signaled. signals the condvar condition variable. makes a semaphore object which is represented by an integer vector of twelve elements. waits for the sem semaphore to be posted. represents a structure for barrier-synchronization. Threads waiting for the synchronization are put in threads which is mutually excluded by threads-lock. When a barrier-synch object is created, count is initialized to zero. Synchronizing threads are put in the threads list by sending :add message. Sending :wait to this barrier-sync object causes count to be incremented, and the sending thread is put in the wait state. When all the threads in threads send the :wait message, the waits are unblocked and all threads resume execution. The synchronization is implemented by the combination of the count-lock mutex-lock and the barrier-cond condition-variable. initializes this barrier-synch object. Two mutex-lock and one condition-variable are created. adds the thr thread in the threads list. removes the thr thread of the threads list. waits for all threads in the threads list to issue :wait. realizes the one-directional synchronized memory port, which synchronizes for two threads to transfer datum via this object. Control transfer is implemented by using semaphores. reads datum buffered in this synch-memory-port. If it has not been written yet, the :read blocks. writes datum in the buffer. Since only one word of buffer is available, if another datum has already been written and not yet read out, :write waits for the datum to be transferred by :read. initializes this synch-memory-port where two semaphores are created and :write is made acceptable.